Plymothian Transit: We are Ten! Well, here it is, My first attempt at a blog. At this point I dont really have a clue what is going to appear here or how it is going to end up looking, but I will concentrate on what is happening with the transportation in and around Plymouth, England. I will try and post something every day if I can. This will either be something that has caught my attention that day or maybe just something of interest from my files. So sit back and relax, and wait - something interesting might just appear at some stage - you never know! Whilst the bus is pretty much the same this does highlight the difference in my camera over the last ten years. The other difference is that the original post was hardly seen by anybody! According to eh Google stats the original has been see 44 times (not bad for ten years!) whilst some of the more recent posts over the Western Greyhound saga have gone well past 1500 hits in a couple of weeks. Although I have never been one for checking the stats everyday and getting too excited at big numbers, it is heartening to know that there are a few people out there reading what I have put together. It has to be said that when I started PT, I didn't really have much of an idea of what I was going to post. 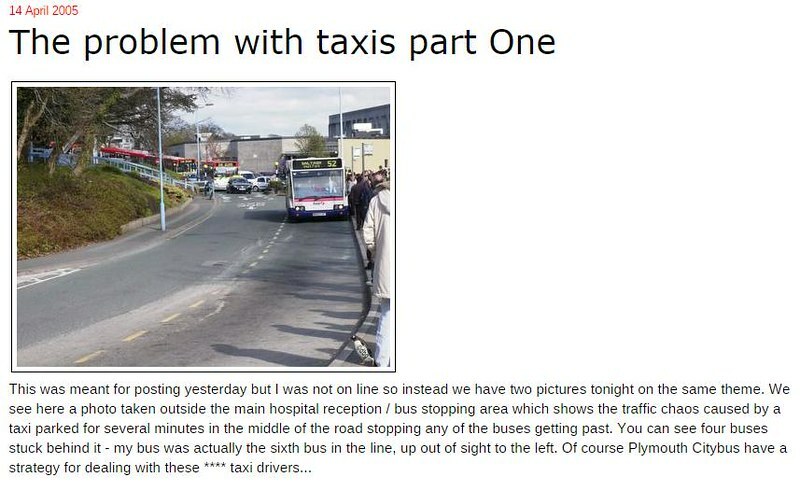 Generally the odd photo of the local buses was the original plan, I didn't really expect anyone else to find it and read it. 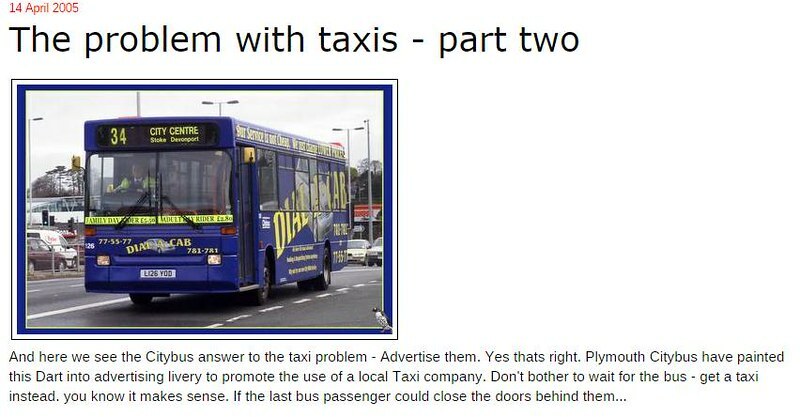 Looking back through my first month on Plymothian Transit I can see the beginnings of a few themes which have prevailed through the last ten years. Having my own blog did mean I could post my own opinions online rather than keep them to myself. If I saw something which annoyed me I could say so. This was back before Facebook etc. really took off. We had the local Yahoo email groups but that was about it. Over the coming month or so I will be looking back at some of the posts from the blog. There is a lot of information here, I may as well make use of it! I wont beat about the bush. There have been a few occasions over the ten years when PT nearly came to an end. 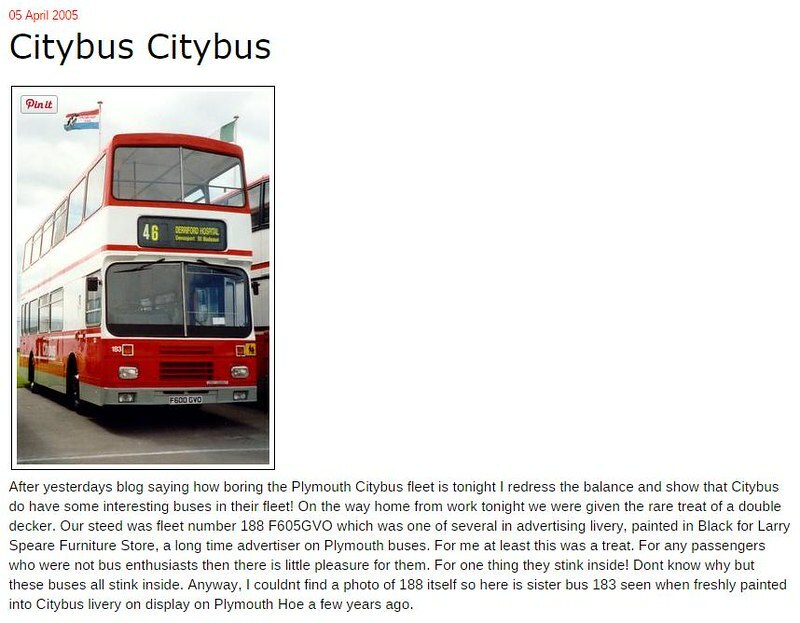 When I started there were only a few bus blogs. The main one being the much missed Omnibuses blog. The scene is a lot busier now with quite a few good quality blogs which do get updated frequently. There have been a lot more which have come and gone, mainly because quite simply, maintaining a regular blog like this one is hard work! I do spend far more time than is healthy on the blog and the sideline web sites, along with reading web sites and books etc for research enjoyment. However, its not all bad. One of the best things that has come out of sticking around for so long, is the number of contacts and regular readers / supporters of the blog. I have made a lot of friends in and out of the industry and on both sides of the main First v Go Ahead camps. The number of people who regularly contribute to the site has grown and is very much appreciated. Although things are fairly settled at the moment, the difficulties of bringing up an autistic child have often hindered getting out and about as much as I would have liked. Knowing that if anything interesting happens out there, someone will let me know and more often than not send in photos has almost certainly made the difference between continuing the blog and giving up. Having said all that, I have to say that I am probably enjoying the blog now more than I have ever done! 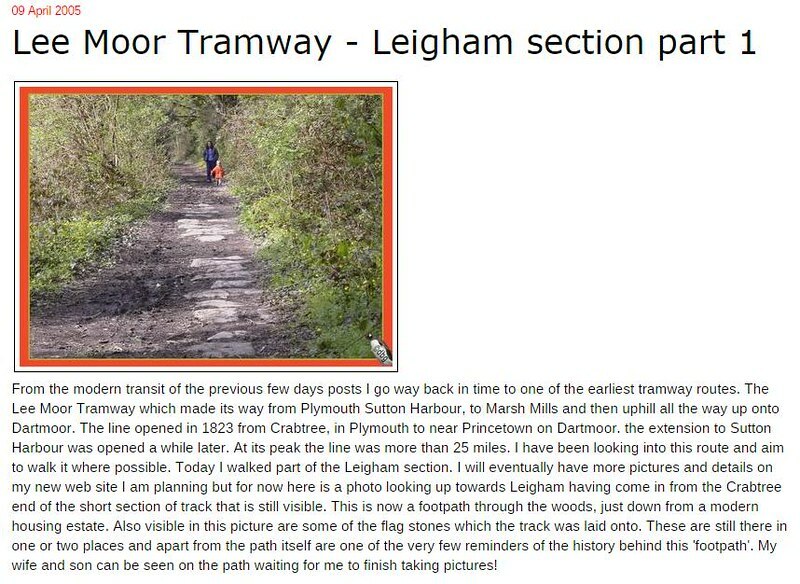 Covering Devon and Cornwall as well has been a challenge but has also increased interest and seems to be very popular. 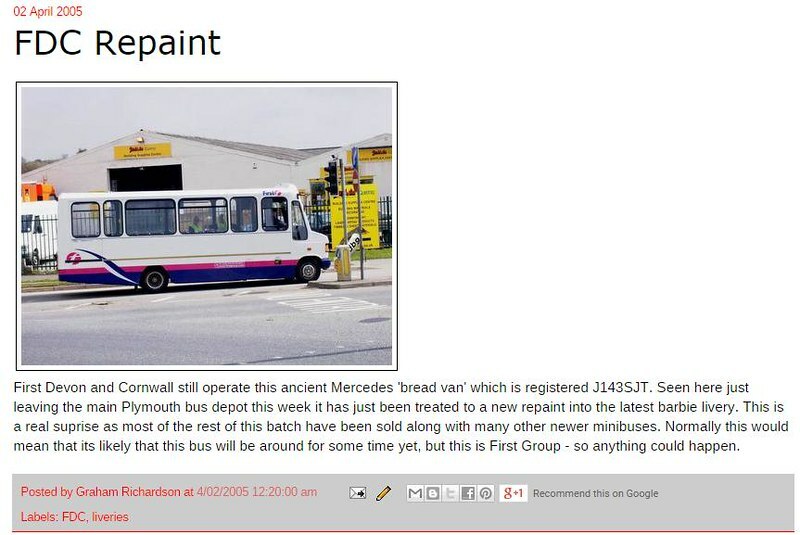 With your help there is probably no reason why Plymothian Transit wont be around for another ten years at least! Thanks to everyone who has contributed, supported, or just read the blog over the last ten years. Page view from Ukraine 34192! Both Citybus and First Kernow are still making changes to their new Cornish networks taken on after the demise of Western Greyhound (more changes coming up too). Its not just the timetables and routes which have needed adjustment. 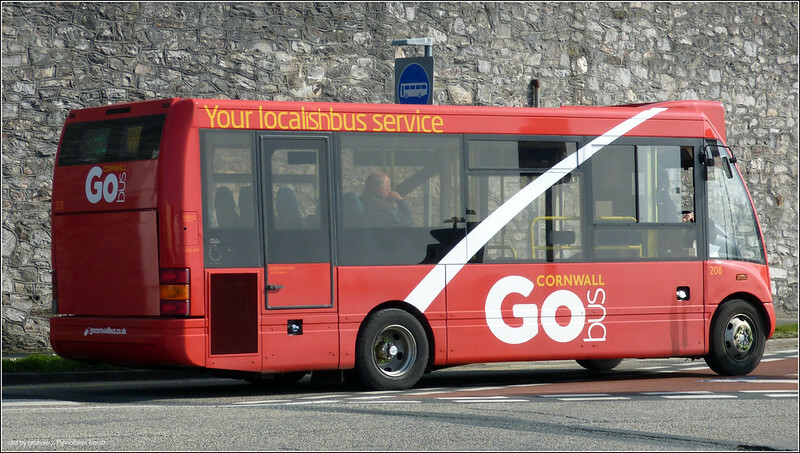 Plymouth Citybus have had to make a slight change to their livery at the request of Cornwall County Council. They would have asked First Kernow to change theirs too, but no one knows what it actually is at the moment! Just an ordinary reader, so thanks Graham for what you are doing, long may you continue. Seems like we are one big family. (You must have been one of my passengers at Kingsbridge last year in the `Back of beyond`. Plympton Dave. Congratulations Graham, and thank you (and your wife!) very much. I live in the West Midlands but visit South Devon around twice a year, so your blog is much appreciated. One thing's for sure - there will be enough happening to keep you occupied for some time to come! Congratulations on 10 years of plymouthian transit Graham. i cant wait to see what bus news there will be next and also i love your new logo Graham. Congratulations on reaching the ten year mark, long may Plymothian Transit continue !